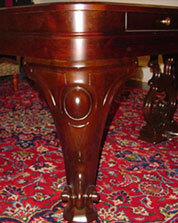 In 2006, Paddon Piano Services rebuilt and refinished a Willis baby grand piano. The piano was manufactured in 1938 and originally belonged to the client’s grandmother. The owner was moving to Rosedale, in Toronto. Her new home had several rooms in the basement. 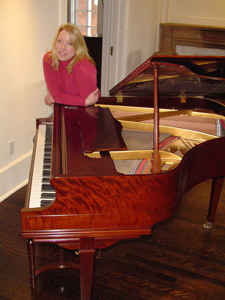 While organizing her storage, she discovered a room with a beautiful rosewood Steinway Square Grand Piano, manufactured in 1867. 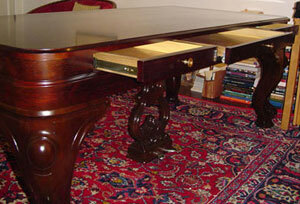 These pianos are not usually worth rebuilding, but they do make beautiful desks. The piano was too high. Its thick sides had to be cut down with a chain saw to the proper desk height. 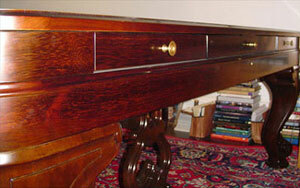 The cut offs were used to make the fronts of the three dove tailed drawers. Once the desk was made it was stripped and refinished.